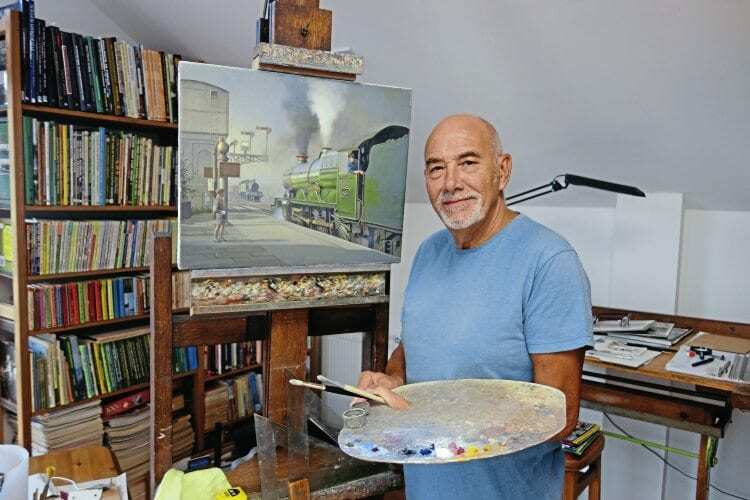 The Nick Pigott Interview: For almost 40 years, artist Philip Hawkins has thrilled us with magnificent images of trains in all their glory. Now The Railway Magazine sketches the life story of one of the world’s greatest railway painters. 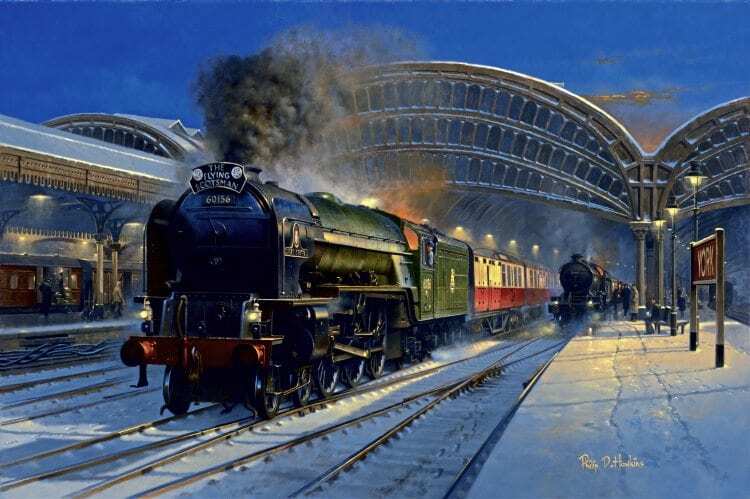 The northbound ‘Flying Scotsman’ treads carefully through York station headed by Peppercorn ‘A1’ class Pacific No. 60156 Great Central, passing ‘B16’ No. 61463. The ‘A1’ was one of five of the class fitted with roller bearings, and a regular choice for this train. 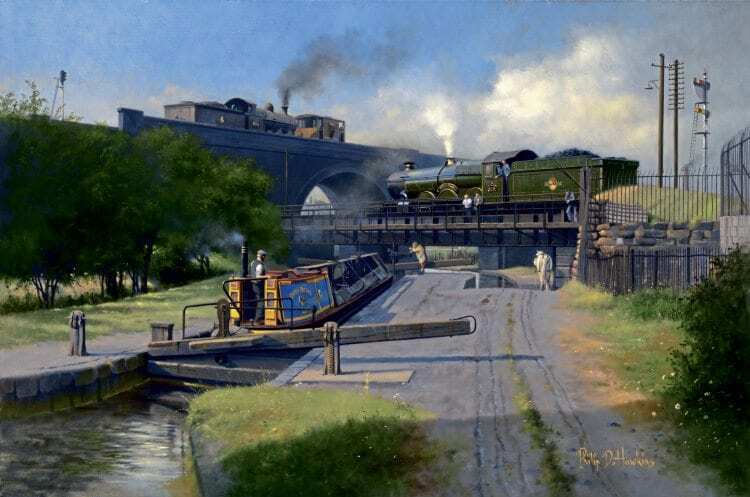 It was partly to weed out such amateurish efforts that the Guild of Railway Artists (GRA) was established in 1979 and one of its founder members was Birmingham-based Philip D Hawkins, who went on to become the guild’s chairman and president. As such, he is a person against whom such criticisms can hardly be levelled. “In the early days there seemed to be a lot of poor pictures in circulation and the guild was formed to set a standard of which we could all be proud,” he told me as we relaxed in his studio overlooking the idyllic Devonian resort of Dawlish. Phil and his wife Sonya moved to the West Country from their native West Midlands in 2001 to be close to the South Devon coast he remembered so vividly from boyhood summer holidays in the 1950s. The famous sea-wall section of the Great Western Main Line was a big influence in their decision too, for Phil never tires of portraying Swindon-built masterpieces. 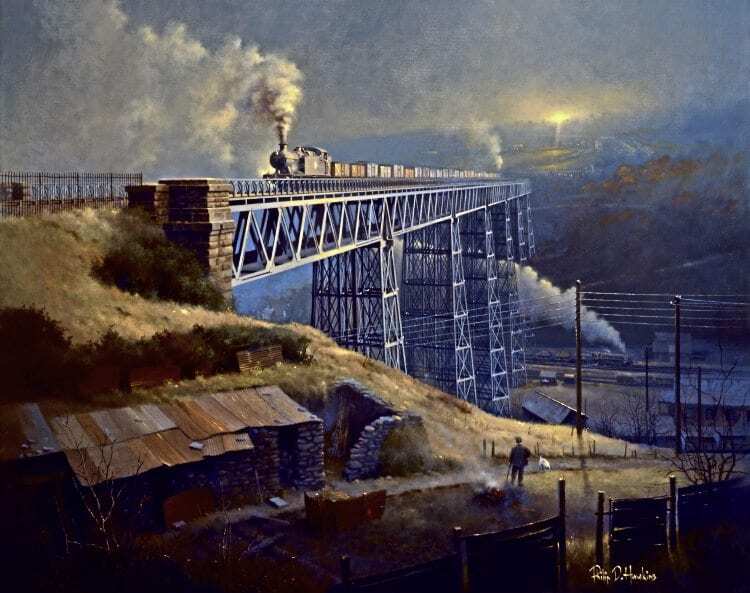 As the last rays of daylight ebb away, a local diverts his gaze to a GWR ‘56XX’ 0-6-2T crossing Crumlin viaduct towards Pontypool Road, while in the valley below, a BR ‘9F’ 2-10-0 heads north with an iron ore train for Ebbw Vale steel works. The date would be sometime in 1960, some four years before the line over the 200ft viaduct closed. The word masterpiece is one that has been applied many times to his own works of art, which today sell for thousands of pounds. Each one takes an average of between six and 12 weeks to paint depending on size, complexity and time required for preliminary research, and he has now produced some 200 since turning professional in 1978. At the moment, his waiting list stretches well into 2018. 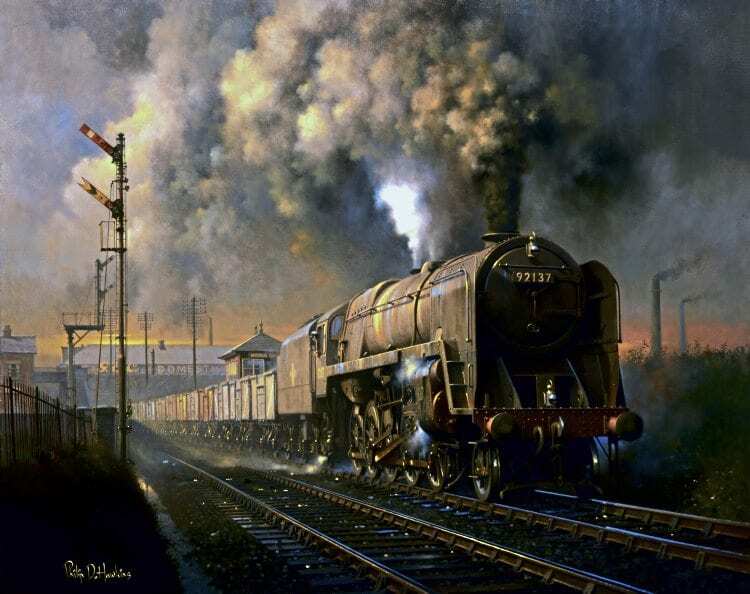 The man who has become one of the world’s greatest transport artists was born a stone’s throw from the GWR’s Tyseley roundhouses in September 1947 and grew up in a terraced house backing onto the embankment of the ex-LNWR Soho loop line in the Birmingham district of Winson Green. That alone would have encouraged most lads to become spotters in those heady days, but the young Hawkins had an additional strong reason to be interested… for trains are in his DNA; his great-grandfather had been an engine driver and had spent a 50-year career working for the LNWR and LMS between 1880 and 1930. “He’d been based mainly at Monument Lane shed and when I was about 11, my dad had the brilliant idea of taking me there to show me where he’d worked. Witnessing the engines from ground level was a magical and awe-inspiring experience and I was even allowed to cab my favourite ‘4F’, No. 44444. Engines of that type we knew as ‘Duck 6s’ and other nicknames we had were ‘Duck 8s’ (for ‘Super Ds’), ‘Blackies’ for Stanier ‘5MTs’ and ‘Consuls’ for Stanier ‘8Fs’. “It was while going round Monument Lane that it dawned on me that the engines I saw every day on the embankment didn’t all come from local sheds but could be based in far-off towns and cities, some even as far away as Wales or Scotland. From then on, I was really hooked! Sunlight struggles to break through the typical engine shed atmosphere at Coventry during the mid-1950s. Engines showing off their 2D shedplates are ex-Midland Railway ‘2F’ 0-6-0 No. 58293, Stanier ‘3P’ 2-6-2T No. 40204, a ‘Super D’ 0-8-0, and Ivatt 2-6-0 No. 46446. Visiting are ‘Crab’ 2-6-0 No. 42856 from Crewe South and ‘Patriot’ 4-6-0 No. 45519 Lady Godiva from Longsight. So far so good, but those were all local sheds and the boys’ appetites for more distant meccas had been whetted, so at weekends, they would tell their mums they were going round to each other’s houses to ‘play’… then jump on a train and travel miles to somewhere like Crewe or Chester for the day! To help their pocket money go as far as possible, they did what a lot of likely lads did in those days and used various money-saving ploys involving platform tickets and suchlike. They also learnt over time which were ‘open’ stations and which trains were most likely to have ticket inspectors. Saturday football specials helped a lot too as they were good for really low fares to such places as Manchester, Liverpool, Leeds and Sheffield. “If our parents had known what we were up to, they would have gone raving mad,” said Phil, “but my mother was a real brick and had helped me a lot with my hobby during my time at Boulton Road Junior School. She knew I could see trains from the playground but that they were too far away to get the numbers, so she’d make a note of any ‘namers’ she saw passing her kitchen window during playtime and when I got home I could see what I’d missed. One day she handed me a list with ‘Patriot’ No. 45528 on it. I said ‘No, mum, that’s not a namer’, but she swore blind it was. Another place that was frustratingly too far from the line was Exmouth, in Devon, to where Mr and Mrs Hawkins took Philip and his sister on a summer holiday in 1960. 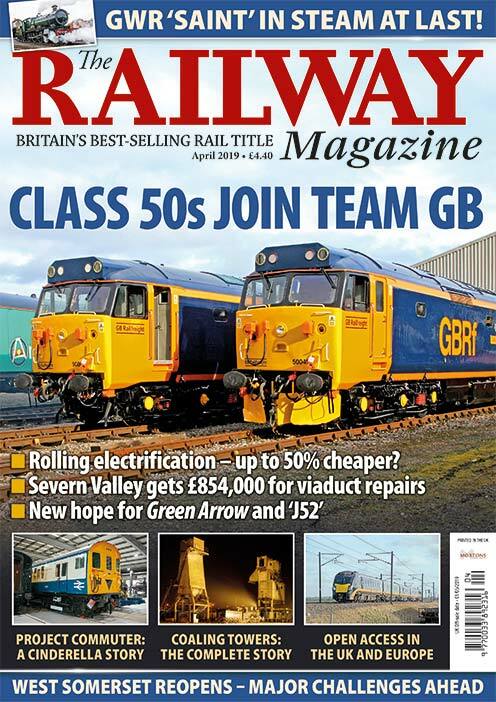 Recalls Phil: “Where we were staying was on a branch line and it was infuriating to see the procession of main line trains passing Starcross on the other side of the wide River Exe more than a mile away, some of which I could tell were hauled by brand new ‘Warship’ diesels. Fortunately, I’d taken the precaution of writing off in advance for permits to visit Plymouth Laira and Exmouth Junction depots, although we only got to the first of those as dad said he couldn’t find the Exmouth one on a map! 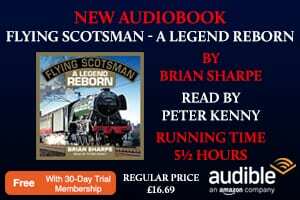 At the age of 13, in 1960, Phil was able to afford an Ian Allan Combined Volume for the first time and also joined the Birmingham Locospotters Club, triggering three glorious years in which he travelled the length and breadth of the country by road coach on shed-bashing tours. In addition, he and a group of friends organised a number of private trips, often involving a midnight departure from New Street to places such as Leeds, Liverpool, Manchester or Carlisle, returning home just in time to grab a few hours sleep before school on Monday. Such experiences will ring a bell with many readers and gave the lads plenty of bragging rights over less adventurous spotting mates at school on Monday mornings. In the classroom, Philip found he could paint much better than the other children and it was thus a natural progression to go to Birmingham College of Art & Design upon leaving school. His parents weren’t keen, taking the view that art wasn’t a ‘proper job’, but Phil smiles at the irony of those comments now as the demands of his commissions frequently keep him at work from eight in the morning until gone midnight. Fortunately, wife Sonya is also a professional artist (although not of railways) and fully understands the situation. Work-stained BR ‘9F’ No. 92137 from Saltley shed gets to grips with a southbound coal train, passing beneath the Birmingham New Street to London Euston main line and over Brickyard Crossing, Birmingham on the climb up to Camp Hill. Freight traffic required banking assistance over this stretch to surmount the difficult 1-in-85 gradient, easing to 1-in-280 before reaching the summit at Kings Heath. Given his background, one might have expected Phil to find early fame as an oil painter, but it was as a technical illustrator at Birmingham’s Metro-Cammell carriage & wagon works in Washwood Heath that he made his living after graduating in the late-1960s. Part of his role there involved creating artist’s impressions from company blueprints to show clients before construction, but although the work was rail-related, he found his interest waning as a result of the end of BR steam a short time previously and decided to make a living from his other great passion – photography. He thus became a freelance press photographer, working for the Birmingham Post, Sunday Mercury and other West Midlands papers before joining the Solihull News as a staff photographer in 1970. The varied world of local journalism saw him covering anything from fetes and fashion to sport and even Father Christmas arriving in a helicopter, and it wasn’t until the summer of 1972 that the railway interest began to return. Former Great Western Railway ‘Castle’ 4-6-0 No. 5045 Earl of Dudley rests awhile during the short trip between the coaling plant and engine sheds at Wolverhampton Stafford Road as its crew and other onlookers enjoy the performance on the Birmingham Canal below. In the background, ‘Super D’ 0-8-0 No. 49246, from Bescot shed, heads towards High Level station to take up its next duty. Once the bug had bitten a second time, Phil gradually became more and more active on the rail photography side and contributed photos to railway periodicals while keeping his hand in with his art hobby whenever he could. 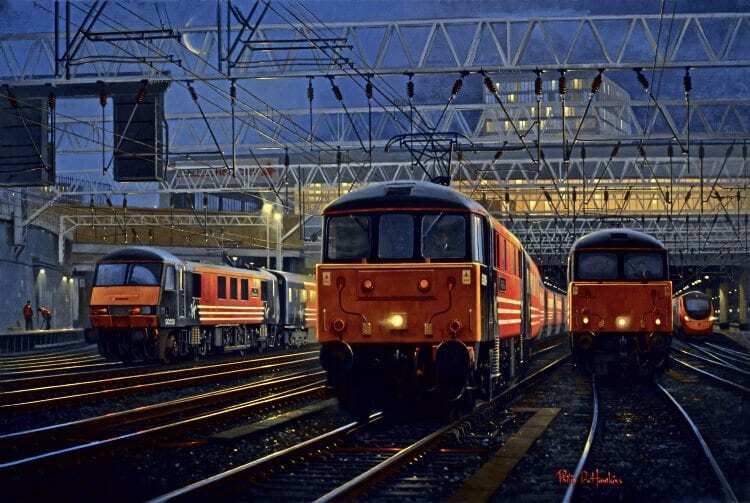 He was thus almost 30 years old before his first railway painting was published (a portrait of a ‘Britannia’ in Locomotives Illustrated) and finally, in 1978, he decided to take the plunge and become a full-time railway artist. Since then he’s gone from one extreme to the other, managing to get almost every one of his paintings published in one form or another, either in books and magazines or as calendars, greetings cards and limited-edition fine art prints. In this regard, he has benefited greatly from the marketing skills of his agent, Bernard Apps, of Quicksilver Publishing, with whom he joined forces in 1988. Bernie and Phil had attended the same schools in Birmingham and decided to go into business together after the BBC commissioned a canvas of the ‘Cornish Riviera Express’ for its Children in Need charity programme. The prints sold very well and on the back of that success, the men decided to launch Quicksilver, although Phil reveals that he had at first wanted to call the company Time Machine. Phil’s portfolio includes modern traction paintings, and here ‘Western’ hydraulic No. D1048 Western Lady bathes in a heady cocktail of smoke, steam, diesel fumes and sunlight as she waits to leave the confines of Old Oak Common engine sheds during 1963. 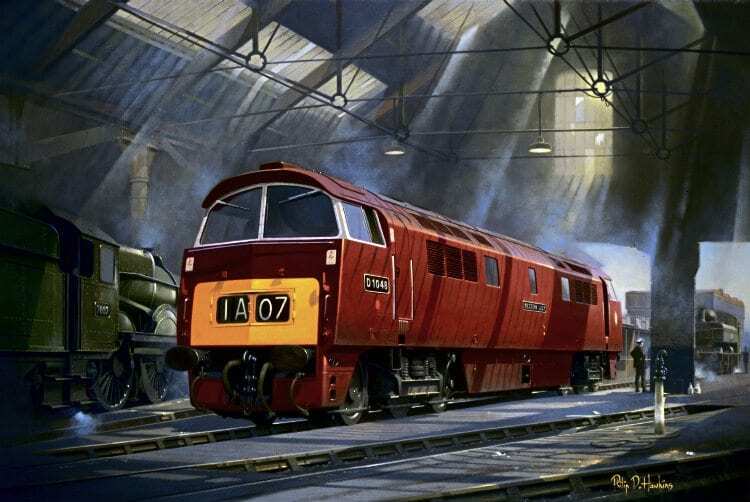 Phil does, however, enjoy the challenge of working on Big Four and pre-Grouping scenes, especially as a painting is often the only way they can be illustrated in colour, and he is equally adept at transforming what some would consider relatively lifeless diesel and electric subjects into atmospheric images. all-important fall of shadows at various times of the day. Even if the line, station or depot has long-since vanished, he will still visit in the hope of finding a surviving building or distinctive horizon that will help set the scene into context. The London end of platform 5 at Birmingham Snow Hill station was a favourite viewpoint to witness stirring spectacles such as this! Churchward 2-8-0 No. 2856, from Stourbridge shed, reaches the top of the 1-in-45 gradient through Moor Street tunnel with an iron ore train from Banbury as ‘Castle’ 4-6-0 No. 5076 Gladiator starts away from platform 7 with an Up passenger service. An exception to the use of photos comes when he needs to paint a steam loco type that is no longer in existence. Where an example does survive, he will visit the relative museum or heritage line and take its measurements, but when the class is extinct, he relies on statistics and pictures, although he points out that many of the photos he uses he took himself during the 1960s. Unlike many of his spotter contemporaries, Phil had owned a camera and made sure he popped it into his duffle bag on shed-bashing trips. His first in 1960 was only good for static locos, but from 1963 until 1966 he had a Voigtlander Vitoret and after that a Pentax with interchangeable lenses. The pictures he took in those days have since become valuable sources of reference when researching paintings. He’s also managed to retain most of his many notebooks and those too come in handy when needing to know which locos to paint into a particular location. “Clients vary in the way they commission me,” reveals the artist. “Some present me with the most highly detailed specifications involving several meetings and copious piles of notes, while others are content with a single vague request. “I normally work up some pencil sketches from different viewpoints to discuss with them and I ask for a 25% deposit as an act of good faith following a few early experiences in which I spent hours and hours on research only for prospective clients to cancel or change their order. 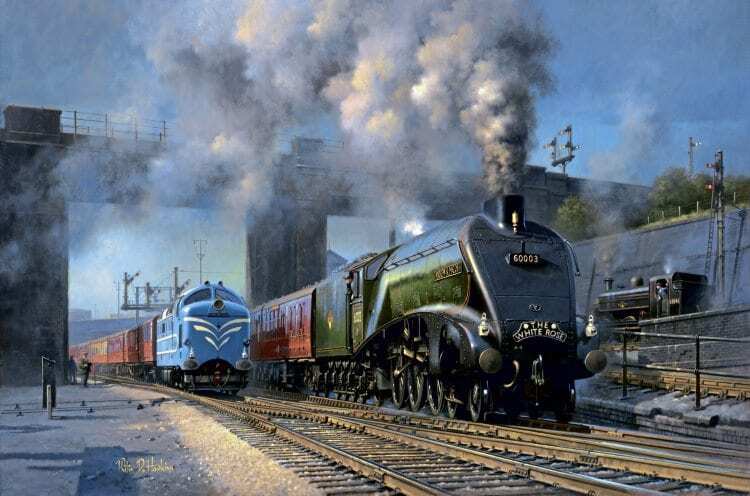 Criticism of other people’s work might seem a little uncharitable, but it’s an essential part of Phil’s work for the Guild of Railway Artists. Phil’s latest painting is this late-1950s depiction of ‘A4’ No. 60003 Andrew K McCosh climbing past Belle Isle out of King’s Cross, shadowed by the prototype ‘Deltic’ as ‘J52’ 0-6-0T No. 68846 waits on pilot duties. Phil was elected chairman of the guild in 1988 and became president when the title was changed a couple of years later. He remained at the helm until 1998 when the accolade of Honorary Fellow was bestowed upon him by members, making him only the third artist to receive such an honour after David Shepherd CBE and the late Terence Cuneo OBE. In the 18 years since then, only two others have been similarly elevated – Malcolm Root and John Austin. Cuneo in his prime was an inspiration to many of today’s railway artists, but Philip also admires the work of one of the most celebrated English painters of all time – J M W Turner. For years, a small print depicting one of Turner’s Venetian masterpieces shared company with locomotive subjects on the wall of the Hawkins studio – a constant reminder that railway art can count among its exponents one of the greatest masters who ever lived. For Turner’s Rail, Steam and Speed, a brilliantly impressionistic rendering of the then-new GWR in 1843, helped initiate a genre whose popularity has mushroomed since the demise of BR steam began, driving more and more rail enthusiasts to seek mementos of their lost youth. Right: All three types of Virgin Trains’ electric locomotives are seen in service at Euston station in this 2003-dated image. On the left, Class 90 No. 90009 The Economist arrives, propelling its Mk3 rake, as Class 86 No. 86244 The Royal British Region and a Class 87 depart on trains for the north. Sneaking into the picture on the far right is one of the new ‘Pendolino’ units, which heralded the end of an era for regular locomotive-hauled trains on the West Coast Main Line out of Euston. Ironically, Phil’s order book is now so full that he rarely has time to produce a painting for himself and if he does, it’s usually a small one he can finish in a reasonably short time. Such a work was on his easel the day I visited in August – a 20in x 16in canvas of ‘Castle’ No. 5037 Monmouth Castle he was producing for the guild’s Railart 2016 exhibition at Kidderminster Railway Museum. Entitled Waiting at Oxford, it’s a minnow compared with the enormous 54in x 36in portrait of Birmingham Snow Hill he once produced for a firm whose offices overlooked the station site. Another Snow Hill scene – depicting crowds of holidaymakers heading for the seaside on a summer Saturday – became one of his best-selling works after being promoted by the Birmingham Post & Mail newspaper group. Eager Brummies snapped up more than 5,000 prints. Phil’s children, Nina and Ben (now grown-up), also appeared in some of his early works, and although they don’t share their dad’s deep interest in trains, Ben has inherited a skill for photo-journalism and is currently editor-in-chief of photography titles at a firm of national magazine publishers. The shed visits of Phil’s teenage years – he managed to get to most of the main ones in England, Scotland and Wales before he was 20 – have left him with an indelible feel for those ‘cathedrals of steam’ and the impressions of hot oil, coal and ash that played on his senses have given him an innate ability to paint it ‘just as it was’. 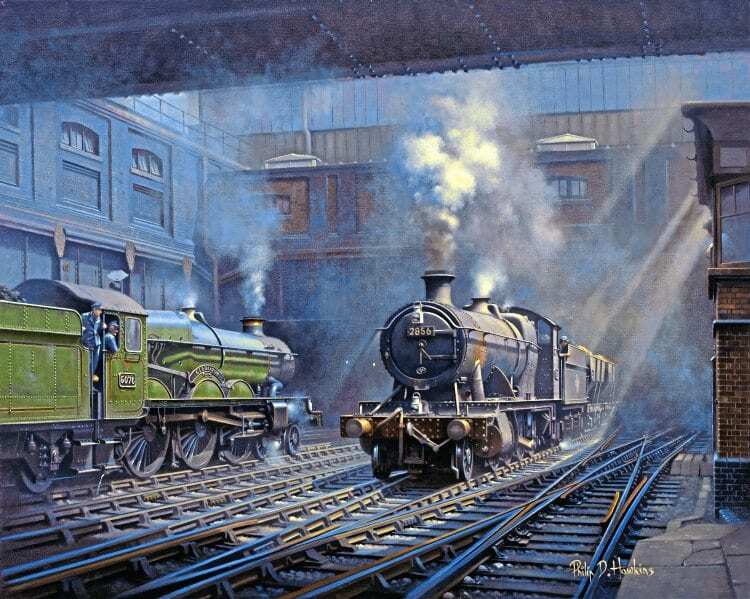 ‘Night Wolf’ (which appeared on the front cover of our October 1992 issue) and ‘Unsung Hero’, depicting a careworn Robinson ‘O4’ class 2-8-0, are just two paintings that convey the atmosphere and clutter of BR steam sheds to a T. Three more of Phil’s paintings have graced the front covers of The RM – ‘Night Freight’ in October 1994, ‘North Pole Dawn’ in March 1995, and this year’s September cover featuring Thornbury Castle. These and many other examples of his work have been published in two large format volumes – Tracks on Canvas and Steam on Canvas – both from the stable of the excellent OPC publishing company and each containing some 50 works of art bearing such clever titles as ‘Summit Meeting’ (two trains passing at the top of the Lickey incline) and ‘Evening Standard’ (a night shot of No. 73156). I can recall perusing both books for errors of detail or perspective and, somewhat perversely, feeling a little cheated when I couldn’t find any worth mentioning! One of the reasons for this is that Phil is meticulous in both research and execution and his uncanny ability to combine the all-important ‘look’ of an oil painting with the accuracy of a photograph is one of the reasons why he has been at the top of his profession for so long. “People might wonder why things like my childhood holidays and days-out are so important to my work,” he comments. “It’s because all the books and photos in the world can’t beat the fact of ‘being there’; the unmistakable aroma of steam, the thrill of seeing a rare locomotive, of walking around sheds surrounded by the sights, sounds and smells of everyday working steam – but most of all, the excitement and anticipation of setting out on those adventures. “Such recollections fuel my imagination all these years later and prevent me from staring at a blank canvas, not knowing how or where to start.